Overture Highlands is a 55+ apartment home community in Arlington, Texas ideal for active adults looking to live a maintenance-free lifestyle with tight-knit neighbors. The Arlington location connects residents to the abundance of restaurants, shops, and fun activities in the area, but Overture Highlands creates plenty of fun of its own. With several resort-style amenities and community events that support social and physical activity, 55+ adults can enjoy their ideal lifestyles at Overture Highlands in Arlington, Texas. Residents of Overture Highlands have access to a deluxe selection of amenities, a sought-after feature in any apartment home community. But with 13,000 square feet of amenity space, Overture Highlands has curated a high-end selection of indoor and outdoor amenities that enhance the lives of residents. Residents can choose from the bistro cafe and the large dining area for a pleasant sit-down meal. The dining area is also used as a spacious meeting place that sets the stage for community events and large gatherings. A demonstration kitchen allows residents to take cooking lessons and participate in fun classes. The fitness center presents a variety of exercise equipment, plus a yoga studio that offers classes. At the library, residents can lounge with a book, and at the theater, they can mingle with friends. A very convenient hair and nail salon is located right inside the community for services close to home. Outdoor amenities include a heated pool, outdoor lounge courtyard, and barbecue grills, which all serve as popular meeting spaces for residents to enjoy. A putting green lets golf enthusiasts practice their swings. A dog park creates an ideal space for furry friends to run around. Overture Highlands features 167 apartment homes that range between 724 and 1,273 square feet and include one or two-bedrooms. They come with several modern features, like quartz countertops, prep islands, stainless steel appliances, and walk-in showers. Other amenities found in each residence include a full-size top load washer and dryer as well as private balconies and patios to encourage outdoor living. Residents at Overture Highland can participate in a wide variety of activities and clubs designed to suit most interests and hobbies. Fitness classes to try include Wii fitness, Zumba, Tai Chi, and water aerobics. Popular gatherings include book clubs and crafting events. Events that appear regularly on the social calendar include holiday parties, potlucks, movie nights, and game nights. Whether residents are interested in history, writing, software, wellness education, or nutrition, Overture Highland hosts classes on the subject. Residents who want to tour the surrounding area can participate in planned trips to local attractions, such as sports games. 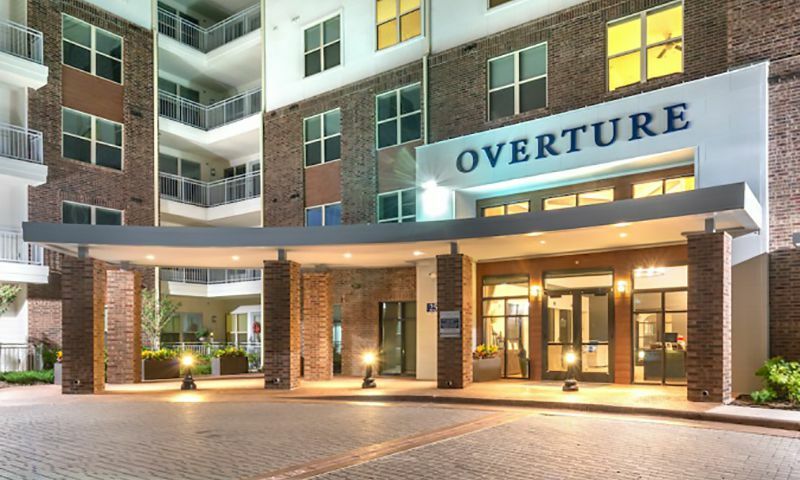 Overture Highland is located in Arlington, TX close to the intersection of Interstate 20 and State Road 360. There are plenty of grocery stores and shopping centers just down the street, including Walmart, The Parks Mall at Arlington, and Grand Prairie Premium Outlets. Those looking to get out for some fun can head to Studio Movie Grill, Arlington Improv Comedy Club, Dave & Busters, Round 1 Bowling, and Arlington Skatium. Residents are also close to Arlington Music Hall, Symphony Arlington, and several art museums for more artistic endeavors. It’s also easy to use public transit to get where you need to be, and the community partners with Lyft to help residents get around town. When residents want to head to the city, they’re just 20 minutes from Fort Worth and 30 minutes from Dallas. When residents need health care, USMD Hospital at Arlington is ideally located just five minutes away. For those who want some fresh air, the community is minutes from Vandergriff Park, Cravens Park, Fish Creek Linear Park, Arlington Tennis Center, and Meadowbrook Park Golf Course. Sports fans will really appreciate that AT&T Stadium and Globe Life Park, homes of the Dallas Cowboys and Texas Rangers, respectively, are both just a 15-minute drive away. There are plenty of activities available in Overture Highlands. Here is a sample of some of the clubs, activities and classes offered here. Overture Highlands consists of 167 apartment homes that range between 724 and 1,273 square feet and include one or two-bedrooms. The residences come with several modern features, like quartz countertops, prep islands, stainless steel appliances, and walk-in showers. Want to learn more about Overture Highlands?